Welcome, everyone, to the unSeminary podcast. Thank you for taking the time to join us today as we talk with Heather Larson of Willow Creek Community Church. Willow Creek Community Church is located in Chicago, and it started 40 years ago at the Willow Creek Theater. Willow Creek now has 8 campuses total. Heather started on staff eighteen years ago as part of the college ministry. She has now been the executive pastor for three years. Willow Creek is currently in the middle of a multi-year succession plan focused on how they can develop the future of their church and hand the church off from the founding pastor into the next generation. Heather is here to talk about that today and what they’re learning along the way. No one person can be the ultimate replacement. // One thing everyone at Willow Creek is keeping in mind is that Bill Hybels started the church from a high school youth group ministry. Bill was the founder of the church and has been the backbone of it over the last forty years. “We know that no one person can replace Bill,” Heather says. “Bill grew this ministry from the ground up. He has more intricate knowledge of the history and how things happened.” Bill has the unique perspective of being able to spot problems before they arise because he’s been so involved in the inner workings of the church from the beginning and no one else will have that advantage. That has led Willow to talk about moving to more of a team approach in leading the church in the future and what that might look like. Leverage the gifts the original leader brings while raising up the new generation. // Part of the reason that transitioning to a new generation is a long process is that you try to address what can be handed off right now and what still remains with the original lead pastor. “I think one of the mistakes we made early on is that Bill had so much energy to figure out what he could hand off and how it would go, that in the very beginning of this process he gave away too much of his teaching and his voice,” Heather says. The new generation ended up asking him to come back and keep teaching and using his knowledge to lead them. At the same time, Willow has been very intentional about creating a culture that is values-driven rather than personality driven. Striking a balance between using the original leader’s gifts while raising up the next generation is key to a successful succession. Develop teams and leaders as the core of your work. // Though they’ve always been focused on it, Willow Creek has put a lot more heat into developing teams and leaders in recent years. And through that, Heather is confident that everyone involved in this season of the church will come out better leaders and better pastors because of how they’re being developed through this. “We all know that long run, what we want is we want Willow to be set up to win and we want each of us to be able to thrive in who God has made us to be,” Heather says. “Whether that’s at Willow or elsewhere.” Put egos aside and focus on finding God’s best for the church and for each other, and make it a point to do this all along, not only in the case of succession. You can learn more about Willow Creek at their website www.willowcreek.org. 00:36 // Rich introduces Heather Larson and welcomes her to the show. 01:20 // Heather talks about the history of Willow Creek Community Church. 02:43 // Heather talks about succession planning at Willow Creek. 03:56 // Heather talks us through the early process of succession planning. 06:20 // Heather shares with us Bill Hybels’ intentions. 08:29 // Heather talks about team unity. 10:13 // Heather talks about leadership development. 12:08 // Heather talks about preserving the values of Willow Creek Community Church. 13:59 // Heather shares her hopes for the future. Rich – Well hey everybody, welcome to the unSeminary podcast. Thank you so much for listening in, happy Thursday, I’m just so honored that you would put us in your earbuds today. We know you’ve got a lot going on at your church, especially as we head into this weekend and I’m just honored you would take some time out. Today you’re going to be rewarded for listening in, because we’ve got Heather Larson, she’s the Executive Pastor at Willow Creek Community Church. You no doubt have heard of Willow, really a church of incredible influence, not only in the Chicagoland area where their campuses are but really around the world. Over 20 thousand people attend their locations throughout the Chicagoland area, they started 40 years ago at The Willow Creek Theater, which is hard to believe, when I saw that I was like, “Wow it’s amazing it’s been that long,” and Heather is the Executive Pastor there. Heather welcome to the show. Heather – Oh thank you so much Rich, I’m excited to be here and looking forward to talking with you. Rich – Thank you so much. For folks, now there’s probably not a lot of those, but for folks that don’t know of Willow, kind of give us the Willow story and then tell us a little bit of the Heather Larson story. How does your life intersect with the story of Willow? Heather – It’s great, well Willow, we just celebrated out 40th anniversary last fall. It was started 40 years ago, out of really a high school youth group that grew into the ministry that it is today. So today we have 8 campuses total. Main, South Barrington campus, we’ve got a Spanish speaking campus that meets in our church as well and then we have 6 regionals around the Chicagoland area. So I started on staff here at Willow about 18 years ago and came in working with our college ministry and really, I was right out of college myself. I had a job with the American Red Cross before that, but got involved at Willow. I absolutely loved it and continued to grow in my role and I’ve now been in the Executive Pastor role for about 3 years. Rich – Fantastic. Well the church is still led by its founding pastor, a man by the name of Bill Hybels, obviously a great leader, and we ended up in an interesting conversation a couple of months ago around succession and I really would love to hear about that. I think there’s a lot of churches who really look to Willow in a lot of ways and I think are looking at whatever happens here in the coming years, as really a chance to learn. So no pressure, don’t screw this up! But I’d love to hear your part in that puzzle and what is that looking like as we’re kind of wrestling to the future here? Heather – Yeah, well Bill described, actually at the Leadership Summit a few years ago, that we are in the midst of a multi-year succession plan that is about looking at how do we develop the future of Willow. So it’s an ongoing conversation for us, it’s something we’ve been in the midst of and a lot of us would say it’s a very long process right now as well. But I would say we feel a ton of responsibility, a ton of joy and a ton of just realizing the impact of what this could have, to be able to really help transition the church from a founding pastor, who’s been around to really handing off the keys, to the next generation. And it’s what we’re working towards, it’s what we’re working hard on and only God knows what the exact outcome is going to be, but we are in the thick of it right now. Rich – Absolutely, well maybe we’ll talk about the front end of this process so far. What are some of the things that you’ve learned as you’ve started to think about the future, started to think, “Okay, we are looking to hand the keys off from Bill to, kind of the next generation.” What are some of those early lessons that you’re wrestling with? Heather – One of the key things that I know you and I had talked about in our previous conversation, is that we know that no one person can replace Bill. Bill grew this ministry from the ground up. He has more intricate knowledge of the history and how things happened and he can look at something and he can spot a problem or an issue right away, because he’s been immersed in it for 40 years. We just know it’s not possible for one person to come in and fully take on the weight and responsibility of everything that he’s carried. So it really has moved us into talking about a team model moving forward, of more, what would that look like, what would that look like to split up some of the roles and responsibilities that Bill carries, to really be able to see people thrive in the midst of their giftedness and to really have a fully orbed team that would help lead Willow into the future? You know, nothing’s finalized. We haven’t landed on anything yet, but for us we’re really passionate about figuring out, can a team model of leadership work as we look towards the future in some way? Rich – Now, are there other models that you’re looking at or thinking through? One of the things I think is interesting about our particular organizations that we lead, is that often founders or leaders of churches, and this is a crass way to say it, I’m not saying you’ve ever said this, this is the way I’ve tried to capture it, is there’s a very real sense that a founder or whoever the lead pastor is, they not only lead the organization, but in a very real sense they’re kind of the core product of the organization; people come because they like to hear, they’ve been blessed by that person’s ministry. Unlike in a corporate setting, if a CEO who’s maybe been the founder and the CEO, it’s grown, but at the end of the day there are very few examples, maybe Steve Jobs, maybe a few examples like that where the founder is really seen as really bolted to what the organization does. I think that’s a unique challenge we have in churches. How are you thinking about that issue, how are you addressing that? There’s kind of the content side of what a lead pastor does but then there’s also the leadership side of what a lead pastor does. Heather – Yeah, very much so. I think that is part of the reason why this has been such a long process for us, is that it’s trying to address really what can be handed off and at what point does that get handed off. I would say one of the mistakes that we made early on is that, I think Bill had so much energy to figure out what he could hand off and how it was going to go, that in the very beginning of this process I actually think he gave away too much of the teaching and too much of his voice. Heather – We ended up coming back and saying, “No, no, no, you’re still here, like we want you teaching more than what you have been doing. We want to leverage your gifts and your influence as long as you are in the seat that you’re in.” So how do you keep leveraging the gifts that he brings and build into and raise up a younger generation at the same time? Which is a very interesting balance in between the two. But I would say, we spent a lot of time; Bill’s very intentional about not wanting our ministry to be Bill driven or focused on his personality. Heather – It’s interesting, we had someone come in, just recently, from the outside and they said it’s one of the things that stood out to them the most, about our culture, is how much we are values driven and not Bill driven and if fact is something is quoted as being Bill driven, Bill goes after it, “No we are a value driven church, we cannot be a personality driven church.” I know that’s intentional for him, because he more than anybody, wants to see Willow thrive way into the future, beyond when he’s leading it and he knows that’s a critical part of: it’s got to be rooted in values, not in personality. Rich – I think that’s a huge takeaway, I hope people are leaning on that for sure. What are you doing from kind of a team development point of view? A part of what I hear you saying is, I get that impression that it’s like, “Hey, we’re all trying to figure out how, across the board, we have a velocity of development within the organization, to try to build folks up.” What is that looking like and how does that relate to what’s happening on the succession side? Heather – I would say, while leadership development has been a key part of Willow, really since the very early days, we have increased that and raised the heat on that in recent years, just to crazy levels. But we would say it’s the core of what we’re doing, is developing our teams and developing leaders and at the end of this process, regardless of what the result is, I know that every single one of us that are engaged in this season, will be better people, better leaders and better pastors, because of how we’ve been developed through this time. So for us as a team, some of the key things that have been really important, is first of all to put egos aside. We all know that long run, what we want is we want Willow to be set up to win and we want each of us to be able to thrive in who God has made us to be, whether that’s at Willow or elsewhere. Heather – So for us as a team to say, “You know what, none of us are fighting or competing for anything, we’re going to put egos aside, we want God’s best for Willow and we want God’s best for each other,” and we’re cheering each other on in that. Really, that’s a key part, because if anyone was positioning or you had pride issues in the way, what is already a very hard, long and complicated process, would become impossible if that was the case. So we’re working really hard on just keeping what is our end goal, and really when we’re unified in that way and focused on that, it makes it joyful to then be going through the process together. So what’s interesting to me, Rich, even as I was thinking about our conversation here today, is the process that we’re in the midst of, the reality is, it’s what we as leaders should be doing all the time anyway. Rich – That’s good, that’s so true. Heather – Because we have a deadline looming out there and it’s not a hard deadline, but we’re trying to pull off succession, we’re doing this in a way more focused way than we would normally do it. But honestly, I think it’s how we should function all the time as leaders developing people around us. Rich – Yeah very cool. Hopefully what it’s doing is actually developing an even more robust culture of leaderships development that will go beyond and benefit Willow for years to come. Willow in a lot of ways is one of those unique name-brand churches that could literally grasp people from anywhere. I think there’s a lot of people out there that would be really interested in working there, but what I perceive as an outsider, is Willow has a desire to really develop leaders from within, even your own story is amazing. Rich – Can you talk through that a little bit? Help us understand your thinking on those issues. Heather – That may very well happen down the road, but we want to see, what can we do to bring our best, because we so much want to preserve the values of who this church is. Again, it’s not that it’s perfect, it’s not that there’s right or wrongs, but with any time you import a leader, you get a full different set of values than what are currently existing in an organization. Rich – Fantastic. I think that is an underestimated reality in most churches, that we don’t think enough about the values that drive and how our people are so critical to that, culture is so important for us to build as leaders in our churches. This has been a fantastic conversation. Anything else you want to share before we pivot into the rest of the episode? Our circumstances have kind of forced us into that place, but I’ll tell you Rich, like what I’m experiencing with that sort of freedom that comes from that, like my hope is that I can carry that with me even beyond this season, just because it gives you so much freedom of, I’m going to be fully invested and I’m going to totally release the results. I like to think that I could function like that day in and day out, but the reality is, our circumstances push us into that right now, and I’m hoping I can take just a little piece of that into the future, because there’s just something very sweet about being able to release the results. Although Willow Creek is not my home church I’ve attended Willow numerous times and follow the happenings there. 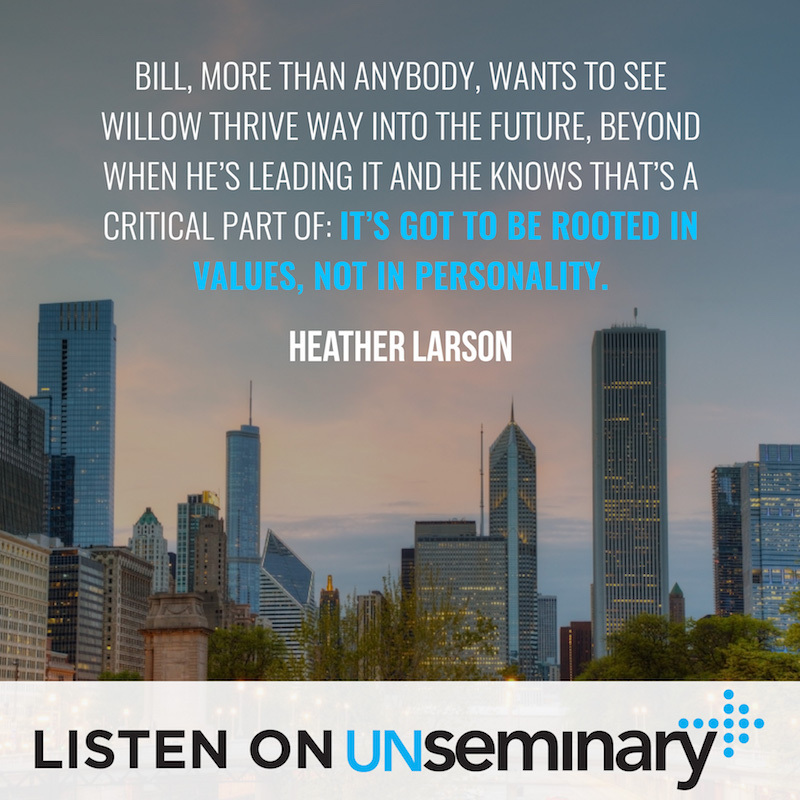 Bill Hybels is a great pastor and I respect everything he has accomplished over the last forty years but my perception is that Bill does not want to share the Willow leadership platform with others. In less than a 30-day period of 2007-2008 three teaching pastors (Mike Breaux, Gene Apple and Randy Frazee) resigned. I must also admit to being shocked at how Bill treated Brian Houston at the 2015 Global Leadership Summit. I wish Willow well in this leadership transition as history indicates it will not be a smooth transition. Gary … head over over to Willow’s site if you are looking for more detailed information on Heather’s background.